Share of Ear: Who’s Listening to What? Share of Ear is the most authoritative study of how Americans listen to audio. It is conducted multiple times a year and it measures reach and time spent with virtually form of audio. 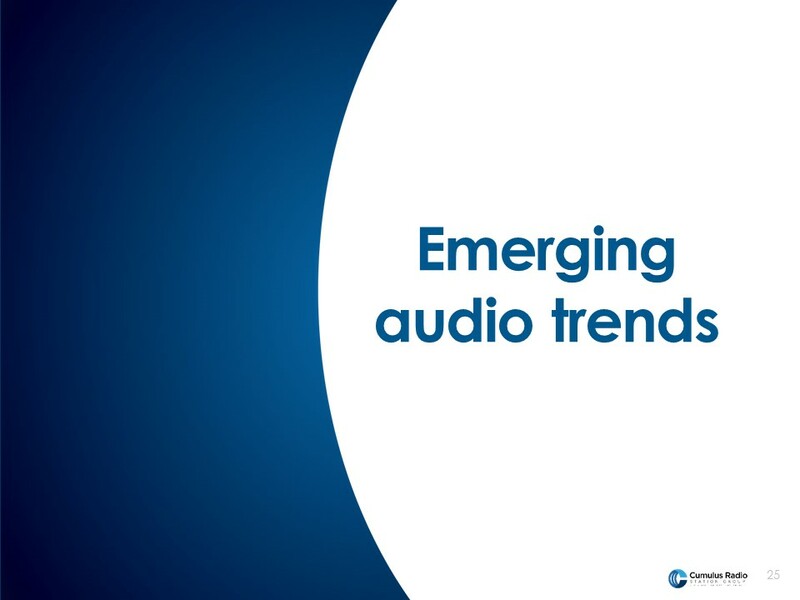 In this report, we will discuss the size and strength of AM/FM radio and emerging audio trends. Edison is a leading provider of AM/FM radio research, with more than 20 years experience. They also conduct exit polling for all national elections for America’s television networks. MARU/Matchbox, formerly the Research & Consulting division of Vision Critical, is a professional services firm of consultants with a deep heritage in both strategic insights consulting and technology. MARU/Matchbox brings a unique level of expertise in delivering Insight Communities, community management, and advanced research consulting services to its global client base. 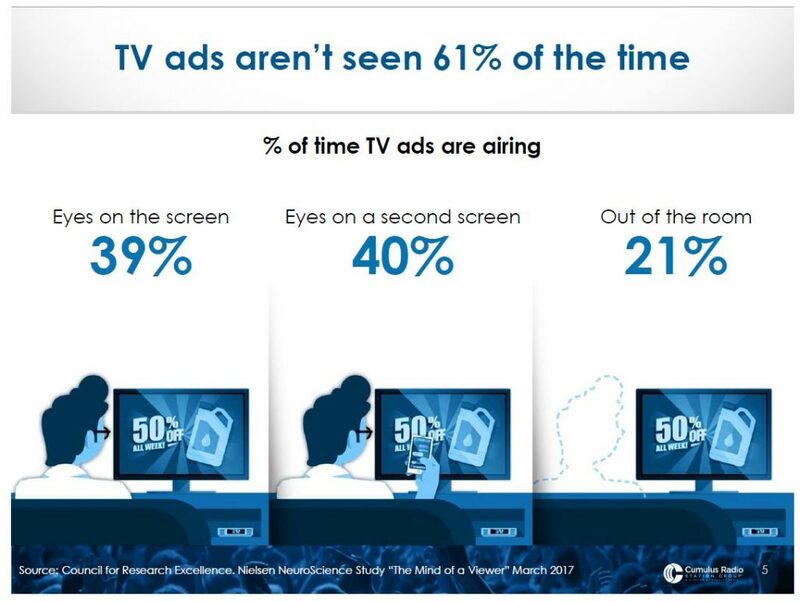 Let’s take a look at the perception of media time spent among advertising and agency professionals. The gold standard study of advertiser sentiment is done by research company called Advertiser Perceptions. 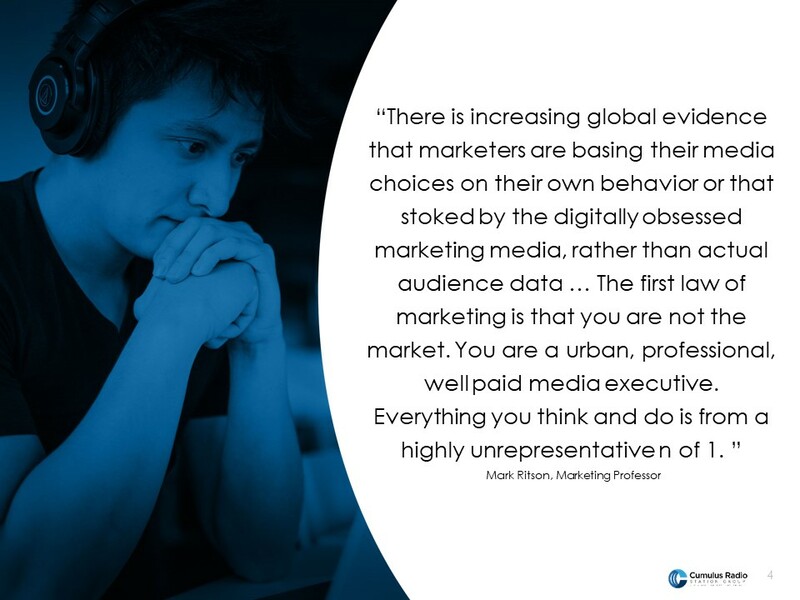 Each month, they survey media strategists, media buyers, media planners, and advertisers to uncover their attitudes and perceptions of media. 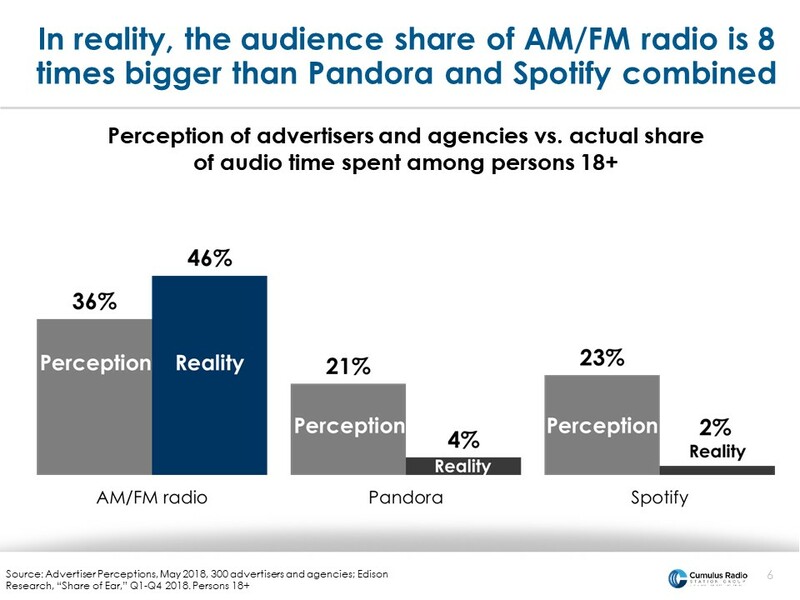 The reality: AM/FM radio’s share is 8 times bigger than Pandora and Spotify combined. As you can see, there is a significant difference between perception and reality! 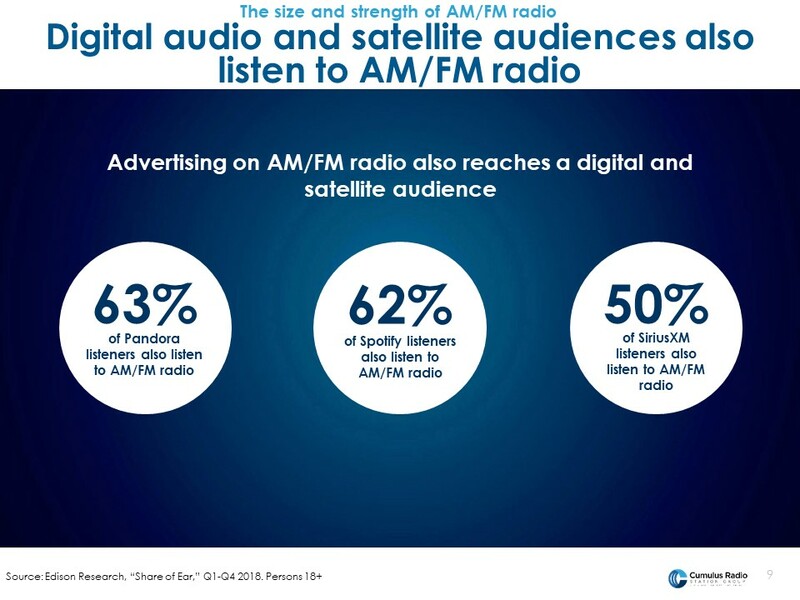 AM/FM radio has a gigantic 46% share. Next are three platforms advertisers cannot run audio ads on: owned music, YouTube, and the advertising-free music channels on SiriusXM. Ad-supported Pandora only has a 4% share, similar in size to the audience share for TV music channels. Those are the channels on your cable system in the high numbers that play commercial-free music. 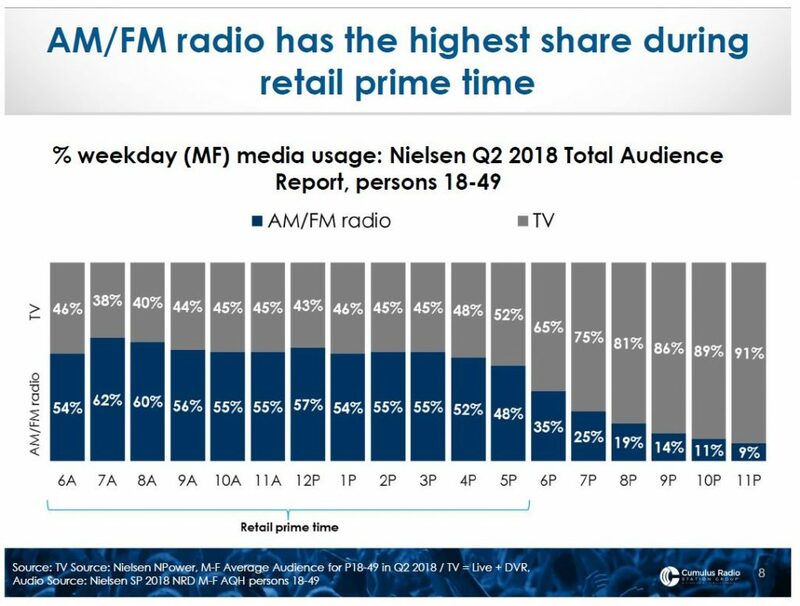 You’ll notice all the way at the bottom, the audience share for ad-supported SiriusXM is only 2%. 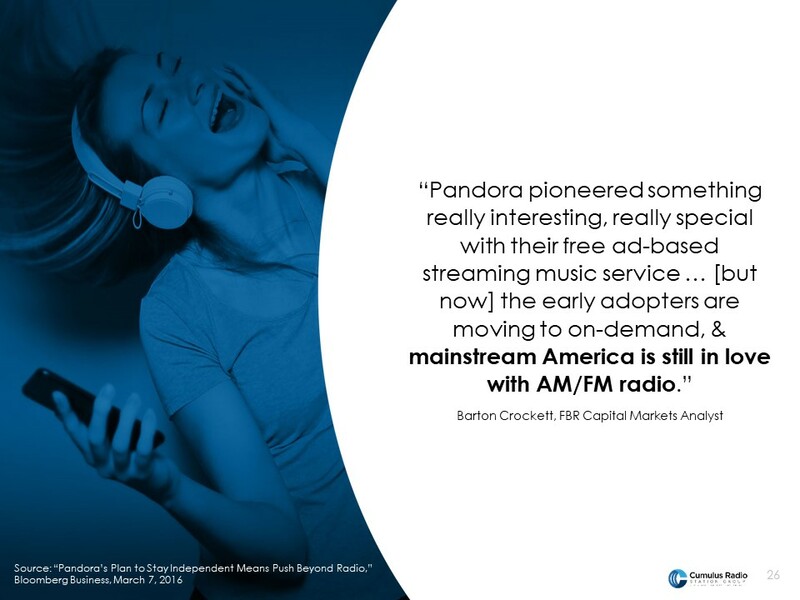 Let’s look more specifically at the comparison between AM/FM radio and Pandora and Spotify. 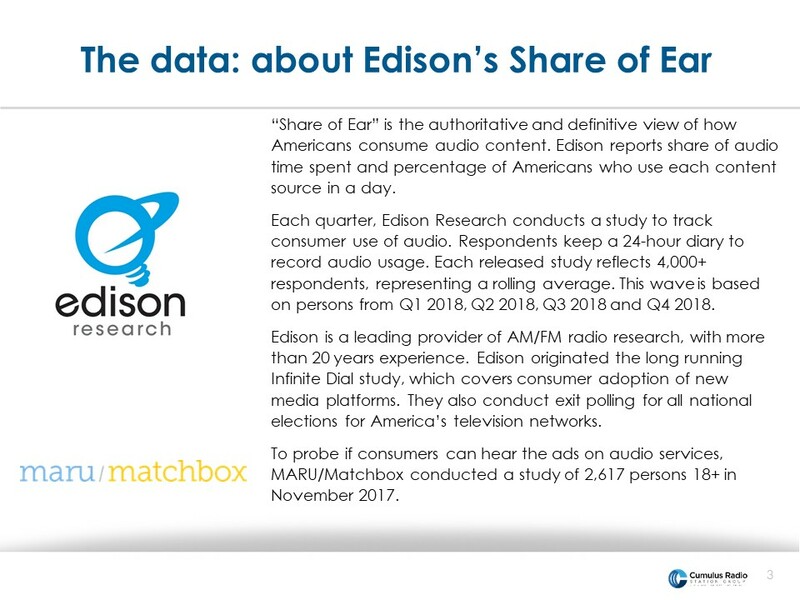 Edison Research’s Share of Ear revealed Americans spend majority of their audio time with ad-supported media – 58% to be precise. AM/FM radio holds the greatest share of any audio time at 46%, edging out ad-free platforms (42%) and other ad-supported platforms (12%). 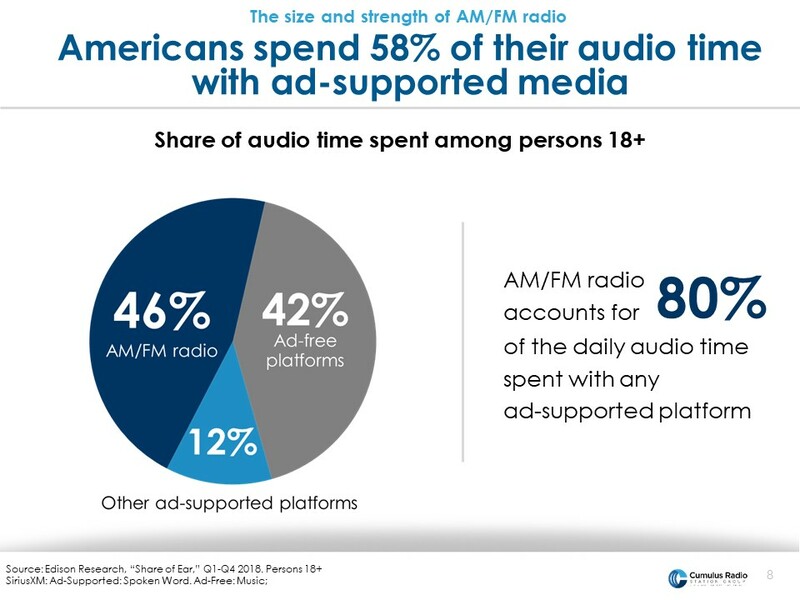 Among only ad-supported platforms, AM/FM radio accounts for 80% of the daily time spent. 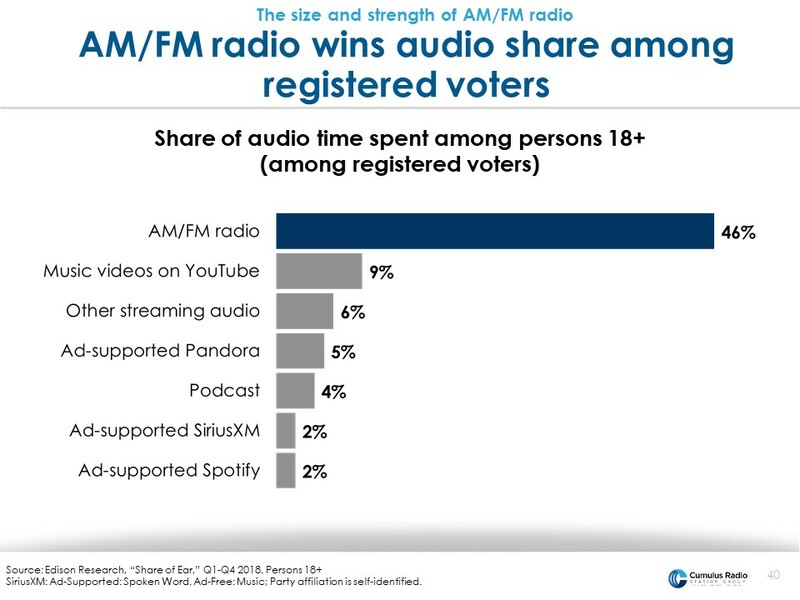 63% of Pandora listeners, 62% of Spotify listeners, half of SiriusXM listeners also listen to AM/FM radio. So, when you buy a campaign on AM/FM radio, you’re getting huge portions of Pandora, Spotify, and SiriusXM for free! What percent of America represents the majority of Pandora’s listening? 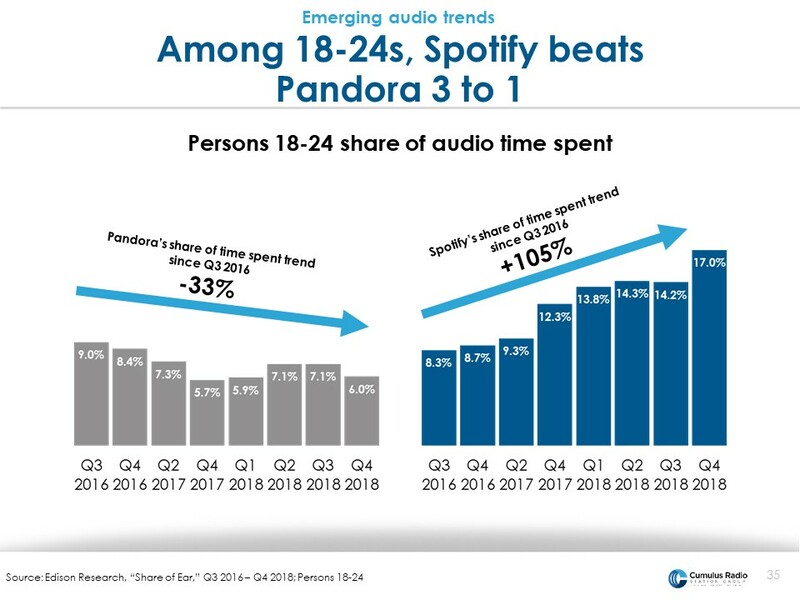 In a typical day, Americans spend close to 2 hours with AM/FM radio, only 12 minutes with Spotify and only 11 with Pandora. Given the exceedingly low Pandora and Spotify time spent, it’s challenging for ads to be heard. Recently, Nielsen conducted a study of factors that drive advertising sales lift. The number one media factor in driving sales lift is reach. 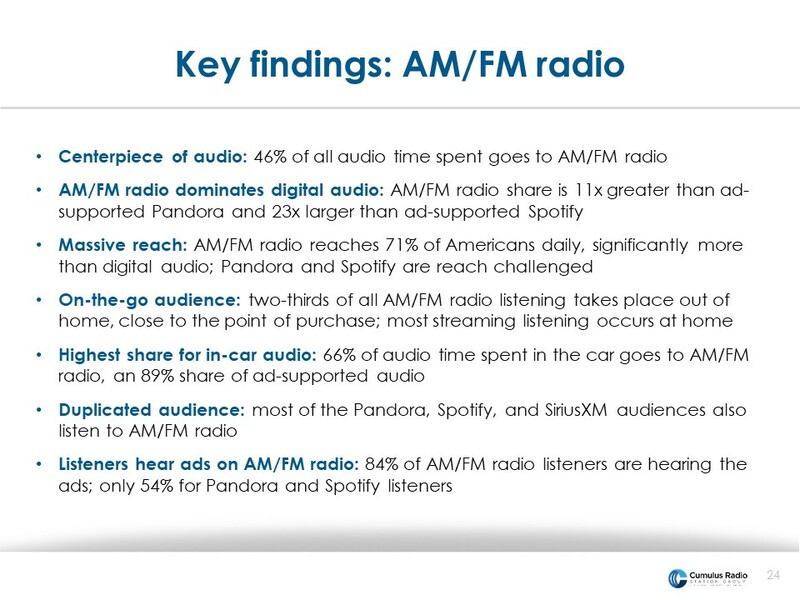 Let’s compare AM/FM radio to Pandora and Spotify for reach. 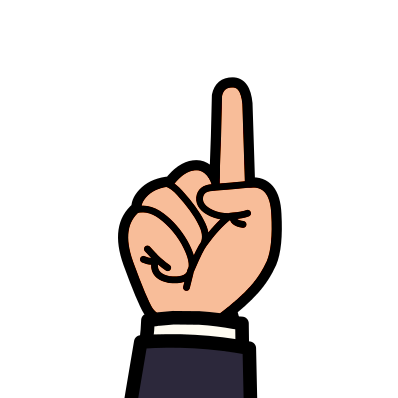 Most of us are familiar with the Nielsen statistic that says AM/FM radio is America’s number one mass reach media with a 93% weekly reach. Here, we’re looking at average daily reach. According to Edison Research’s Share of Ear, 71% of Americans are reached by AM/FM radio in a typical day. Only 10% are reached by ad-supported Pandora and only 4% are reached by ad-supported Spotify. 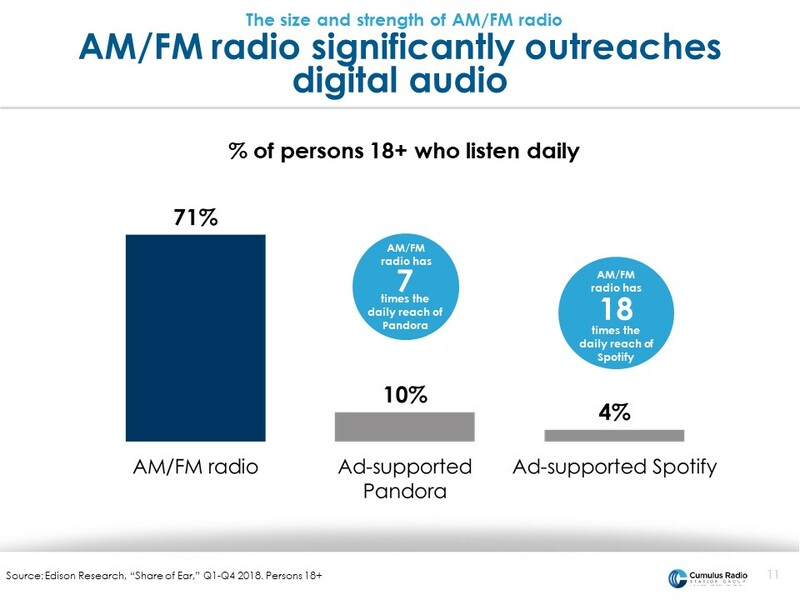 AM/FM radio reach dwarfs Pandora and Spotify. In a typical day in America, 90% of Americans are not reached by ad-supported Pandora. 96% of Americans are not reached by ad-supported Spotify. 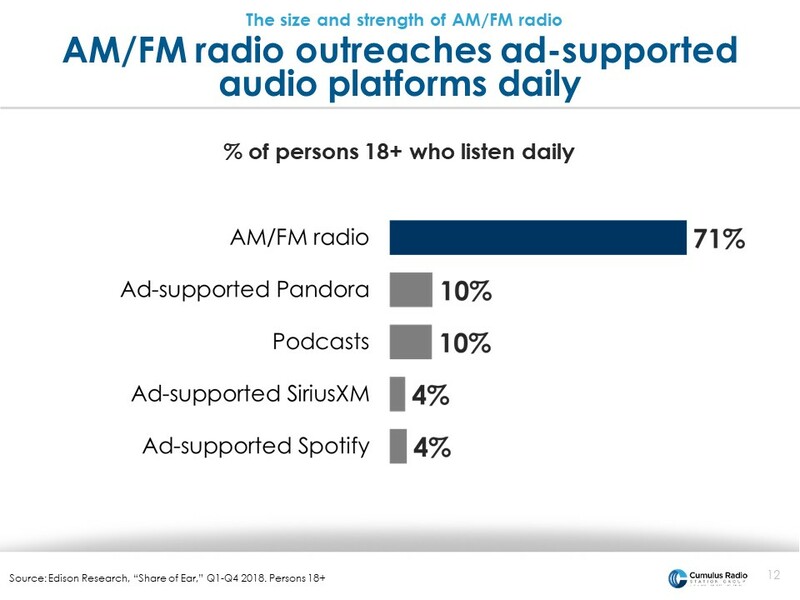 The daily reach for AM/FM radio surpasses the most popular ad-supported audio platforms. 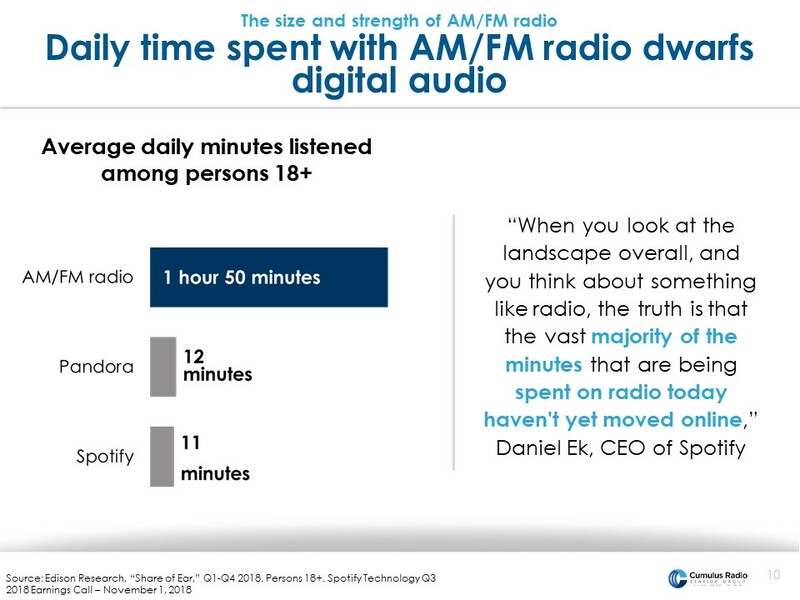 As mentioned in the previous slide, Edison Research’s Share of Ear, shows that 71% of Americans are reached by AM/FM radio in a typical day. 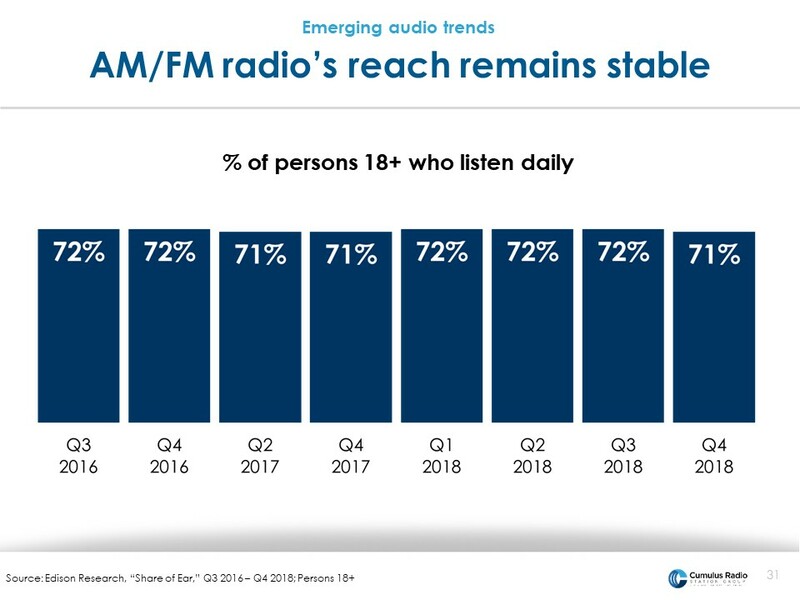 AM/FM radio’s reach is 7x bigger that ad-supported Pandora and podcasts, and 18x bigger than ad-supported SiriusXM and ad-supported Spotify. 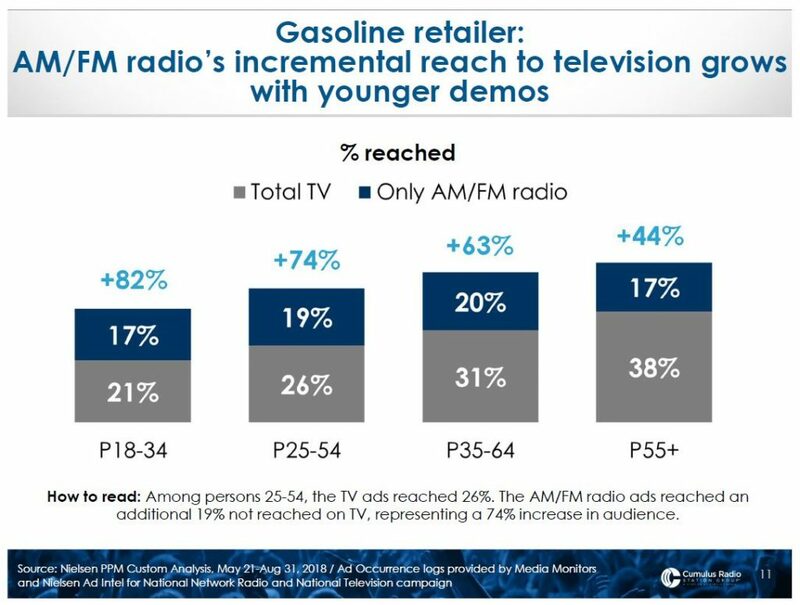 AM/FM radio continuously proves itself as a reach machine. Song for song, AM/FM radio wins. 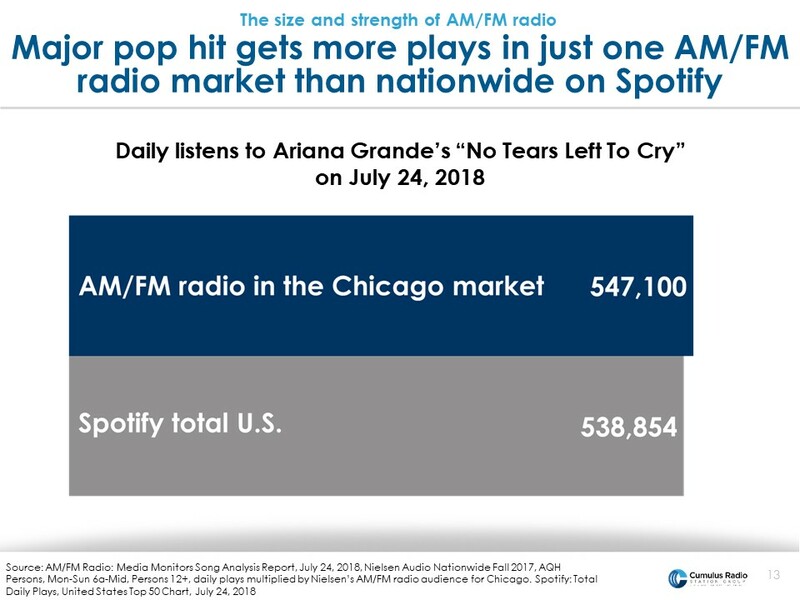 Looking at Ariana Grande’s major hit “No Tears Left to Cry,” there were more daily plays this July in just Chicago than on all of nationwide Spotify. The size of the digital platform can’t measure up. 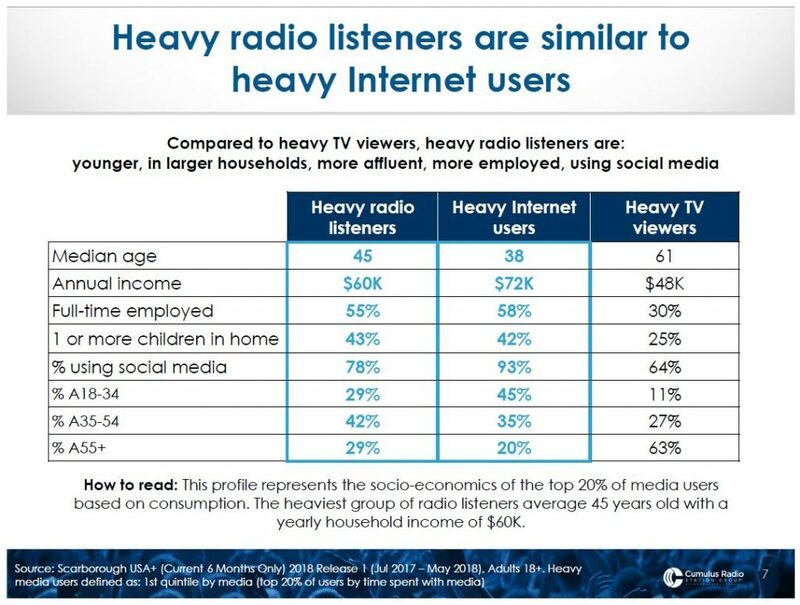 When we examine where people listen to AM/FM radio and streaming, we see significant differences too. 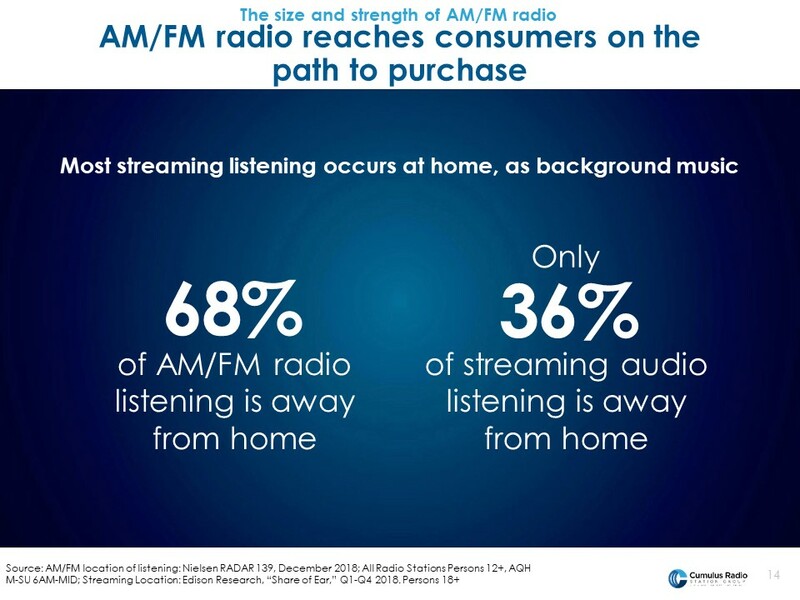 Two-thirds of AM/FM radio listening is away from home, as consumers listen in the car, at work, and other places. Streaming, on the other hand, mostly occurs at home. This is surprising to many people we talk to. There once was a day where you would come home and put on a CD or an album in the background to relax. Now, streaming has replaced the music collection as how Americans relax with background music. With so much listening to streaming occurring at home as “chill out” music, it’s concerning to advertisers if people are actually hearing their ads on Pandora and Spotify. 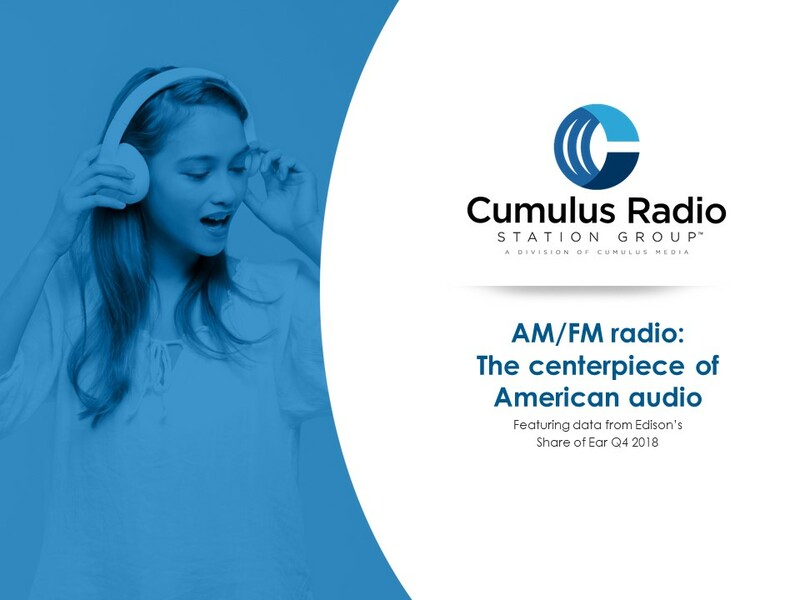 How many Pandora and Spotify listeners are also reached on AM/FM radio? 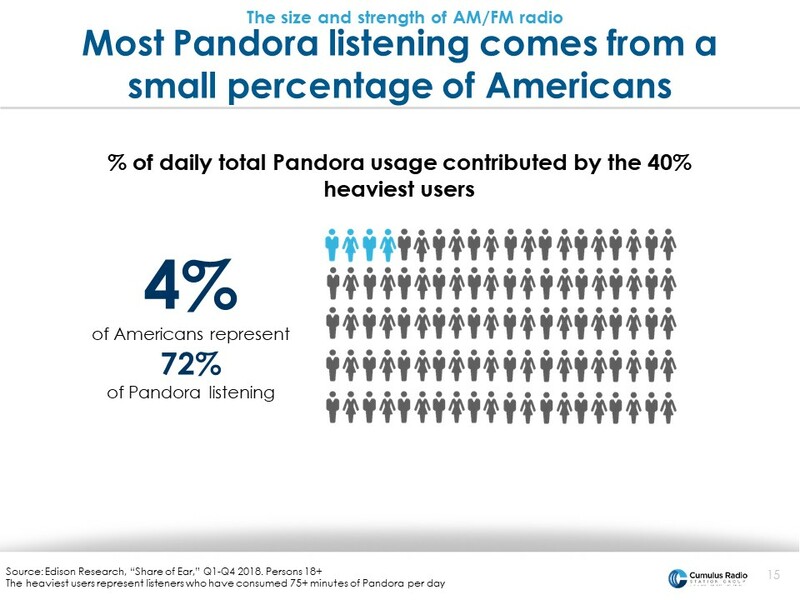 Amazingly, only 4% of Americans represent most of listening to Pandora. Be careful not to overspend on Pandora. Because the reach is so small, you’ll only end up irritating consumers who will hear your ad endlessly repeated. 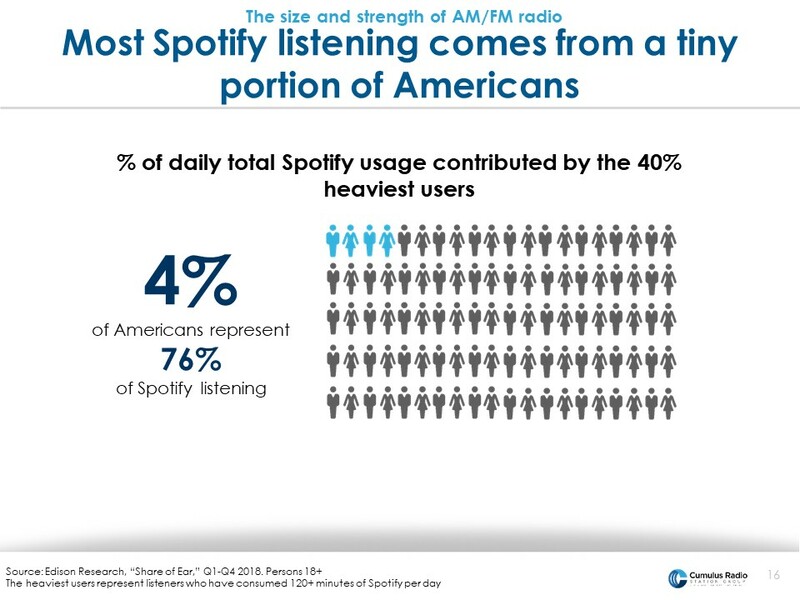 Only 4% of America generates most of Spotify’s audience. To reach the rest of the country, AM/FM radio is America’s #1 mass reach media. Are these groups of listeners highly engaged with the audio and paying attention to the ads? 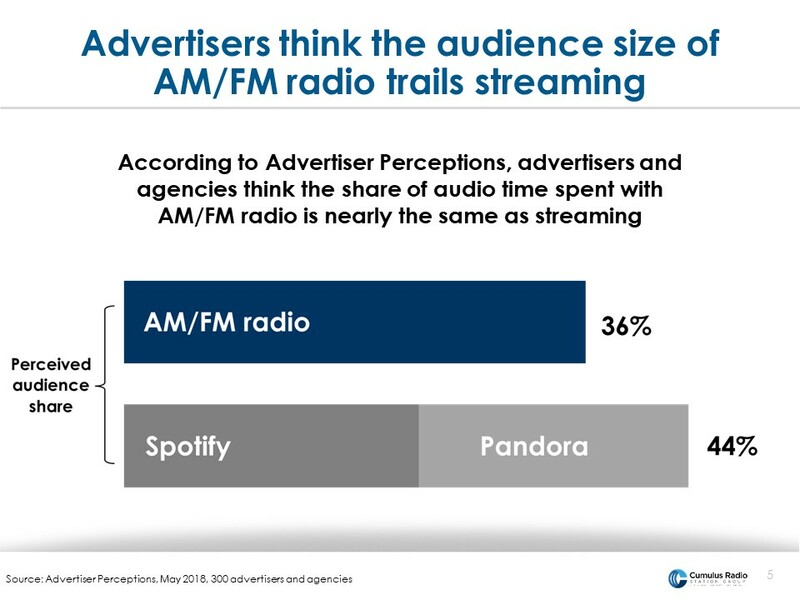 Compared to Pandora and Spotify, listeners pay more attention to what they hear on AM/FM radio. 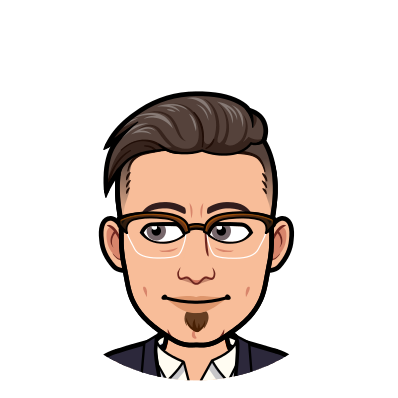 84% of AM/FM radio listeners hear what people are talking about when they’re listening at home, at work, or in the car. 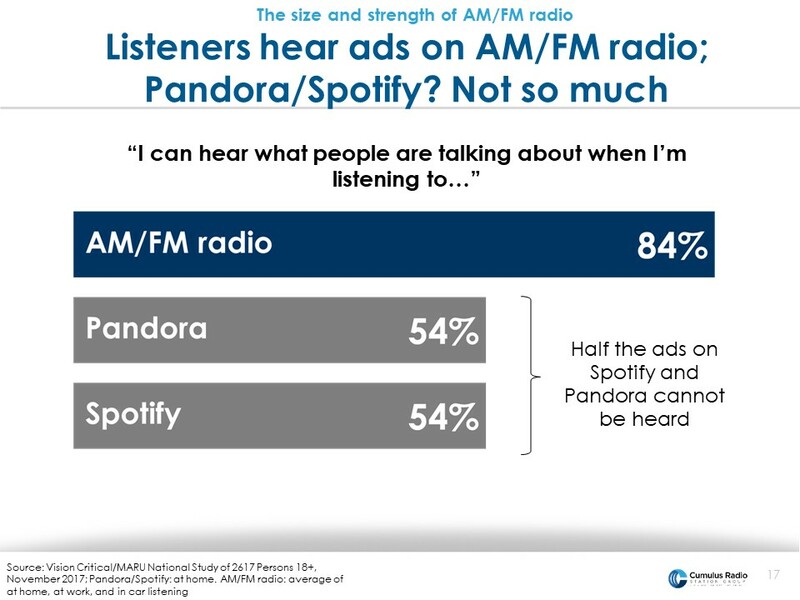 For Pandora and Spotify in the home, only 54% of people hear what is being talked about. They aren’t paying attention and they aren’t engaged with the ads the same way they are when listening to AM/FM radio. 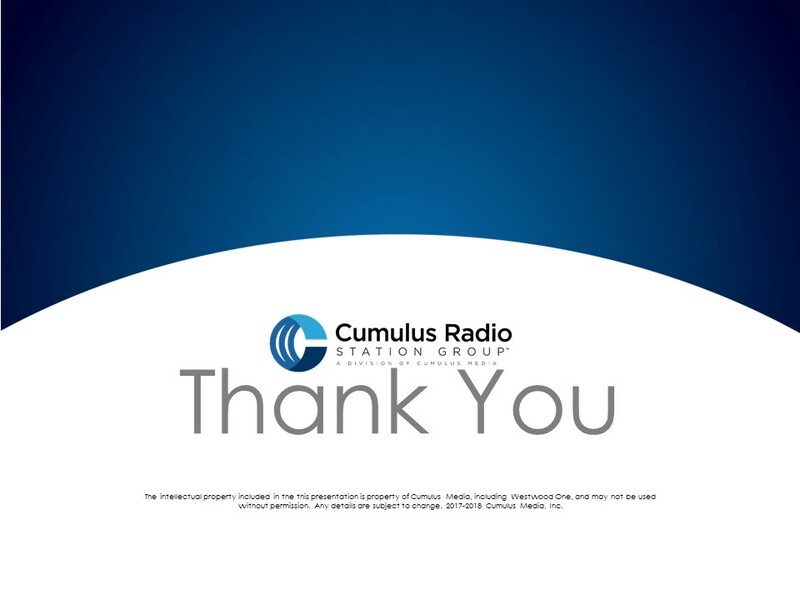 Up until now, we’ve just been focusing on total AM/FM radio listening in all locations. Now, let’s focus on Share of Ear in the car. 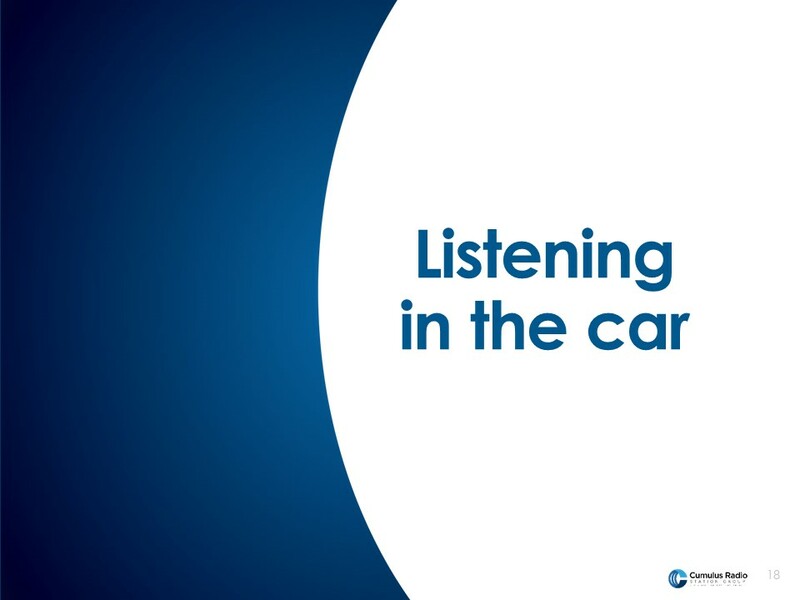 Edison Research’s survey captures audio use at work, at home, and in the car. We hear so much in the press these days about the connected car. All of these articles give the perception that there is a tremendous amount of streaming audio and podcast listening occurring in the car. Colin Kinsella is the CEO of media agency Havas. 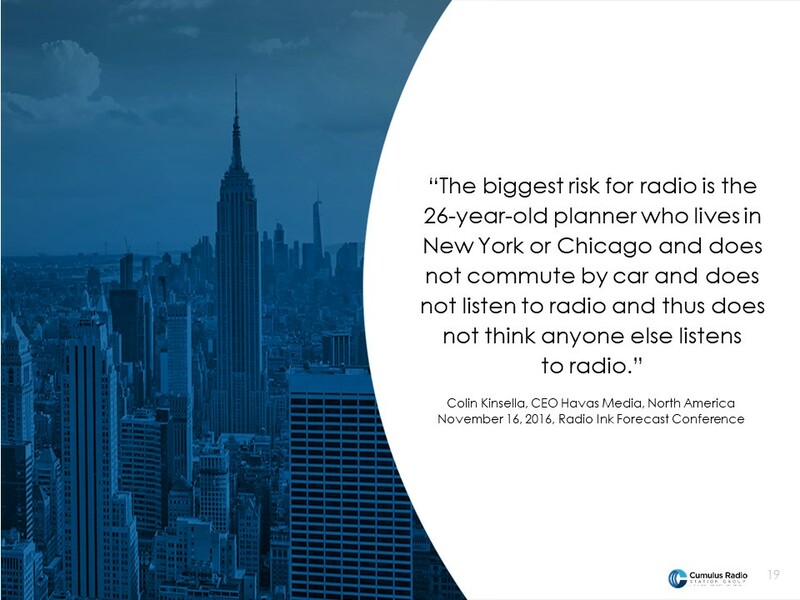 At a media conference, Kinsella was quoted as saying, “The biggest risk for radio is the 26-year-old planner who lives in New York or Chicago and does not commute by car and does not listen to radio and thus does not think anyone else listens to radio.” If you’re a 26-year-old media planner in New York who takes the subway and listens to Spotify, you could think everyone in America is just like you. Let’s take a look at the actual Share of Ear for audio in the car. AM/FM radio is the undisputed king of the road! 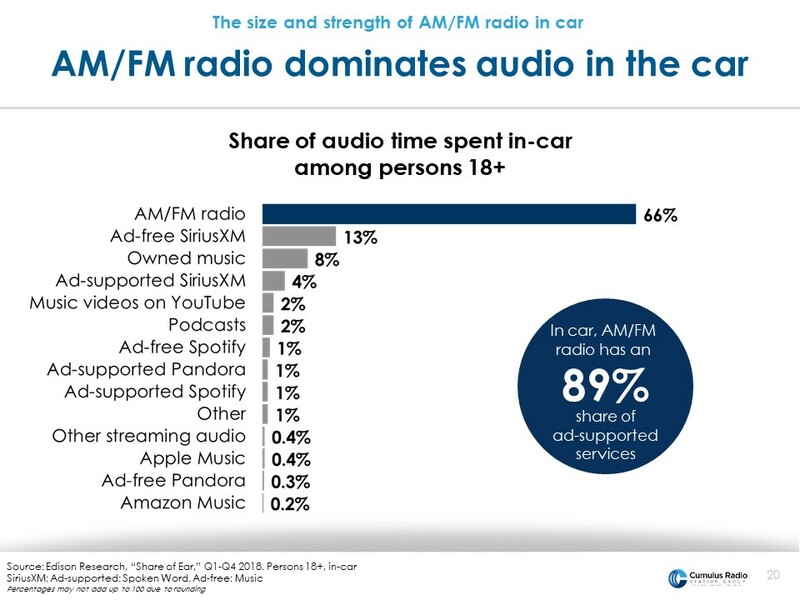 AM/FM radio has a stunning 66% share of in-car audio. You can’t buy advertising on the next two platforms. The advertising-free music channels on SiriusXM have a 13% share and the share of time spent for the music people own, like iTunes downloads on their phone or CDs, is a 8% share. After that, the other platforms’ audiences are incredibly small. 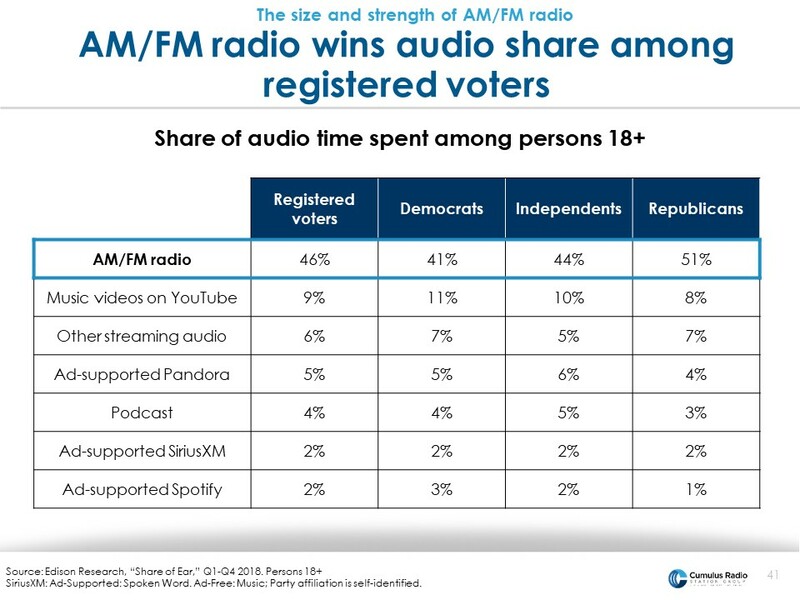 If you just look at AM/FM radio’s share of ad-supported audio, it’s a massive 89%. According to the U.S. Census, 85% of Americans commute to work in a car or a truck. Only 5% use public transportation and the rest either bike, walk, or work at home. Interestingly, the American commute is a solitary experience. 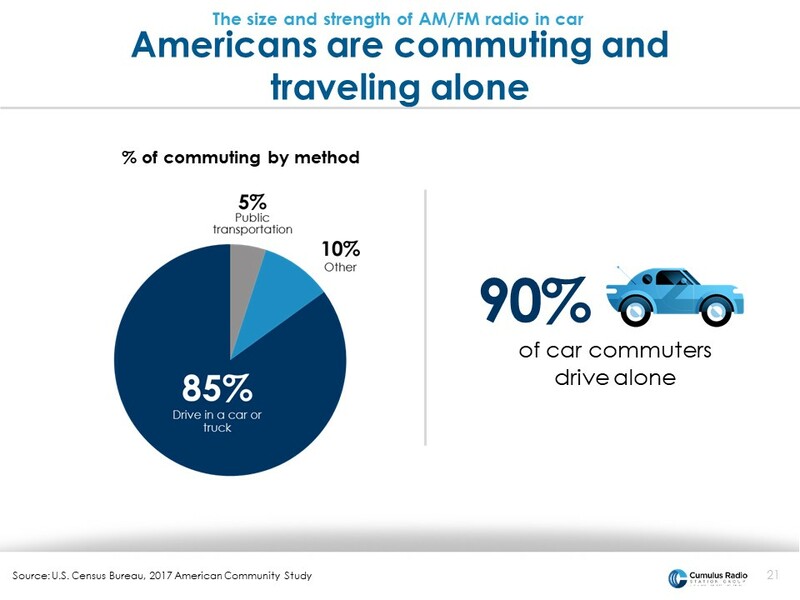 90% of those who commute by car or truck do so alone. This is really useful to know when you consider the creative for radio ads. When you’re having a one on one conversation, you don’t need to yell and shout. The American commute is an intimate one on one experience and you’re ad creative can be more personal and conversational. So let’s look at how Americans commute in the biggest U.S. cities. Here is the commuting patterns according to the Census of the major U.S. cities. Only in New York do we find the majority of commuters using public transportation. As the CEO Havas Media noted, living in New York one would think everyone uses public transportation to get to work. 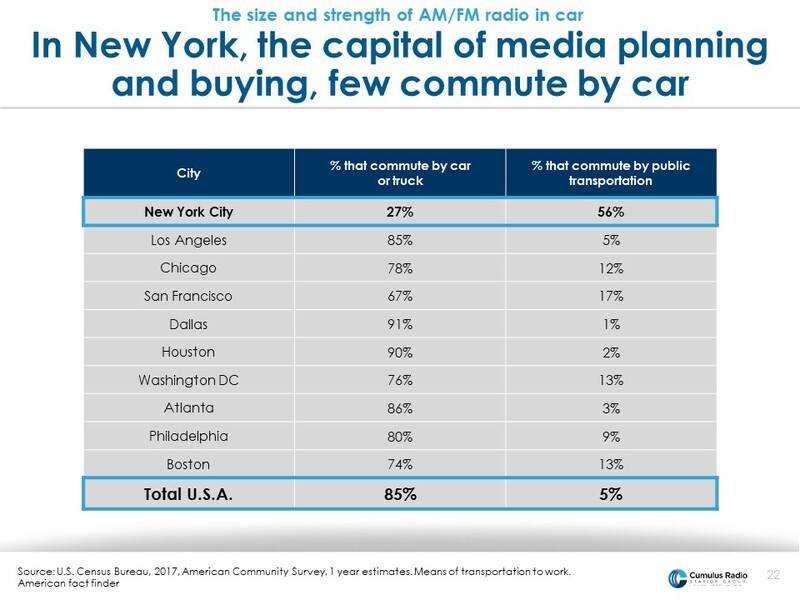 Does a media buyer or planner’s commute impact the way they buy media? This study of 423 media planners and buyers says yes. 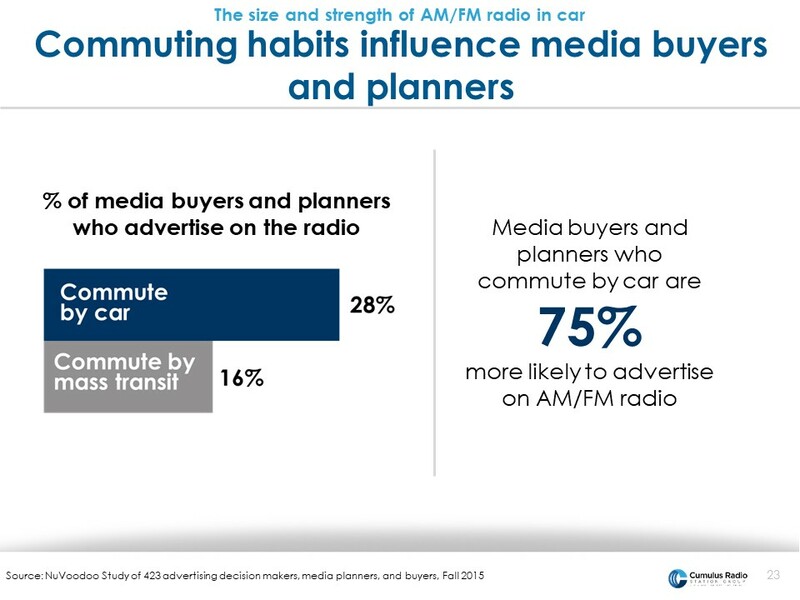 Media decision makers who commuted to work by car are 75% more likely to advertise on AM/FM radio! When we were trained as young media professionals, we were taught to “take the me out of media.” It’s clear that it is very difficult to separate personal experiences from how one views the behaviors of the rest of the country. 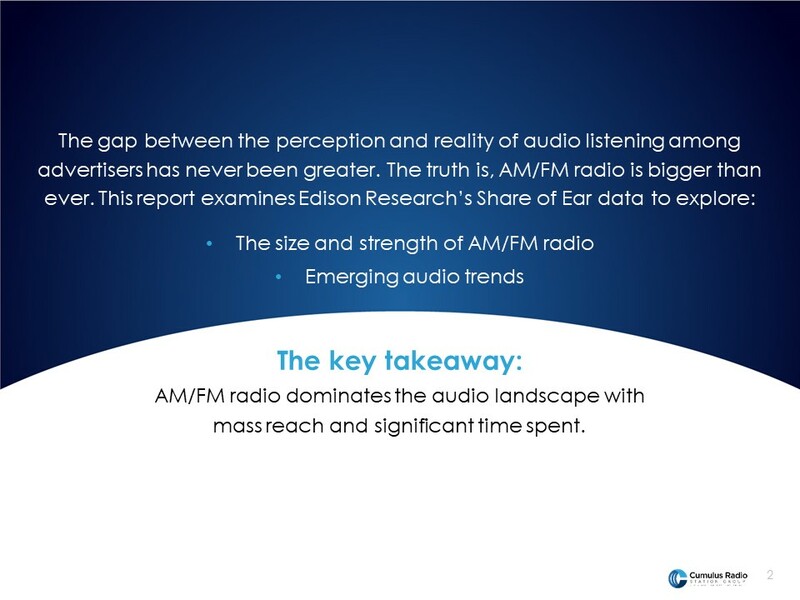 Overall, Share of Ear reveals the majority of ad-supported audio impressions can be found on AM/FM radio. What’s the perspective of media decision makers? 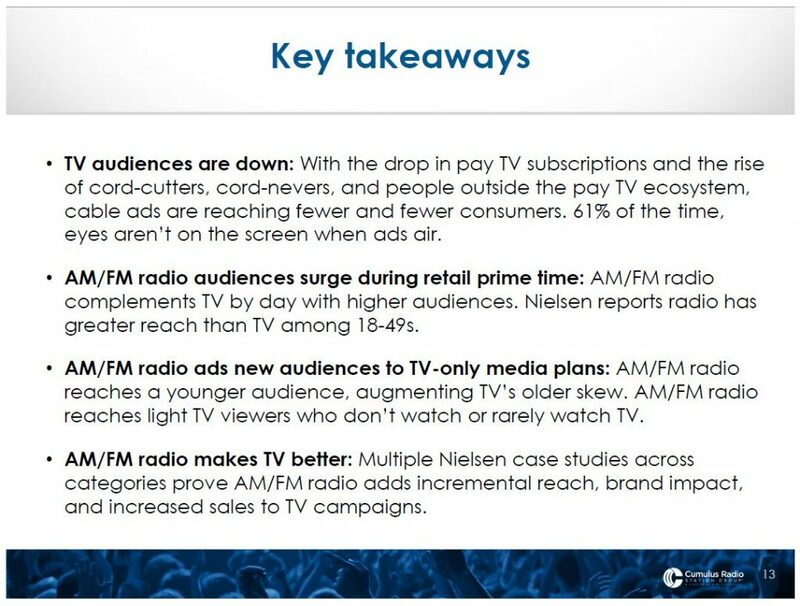 So in conclusion, the key findings are: AM/FM radio is the centerpiece of audio and dominates digital with massive reach. Most AM/FM radio listening takes place on-the-go in the car. 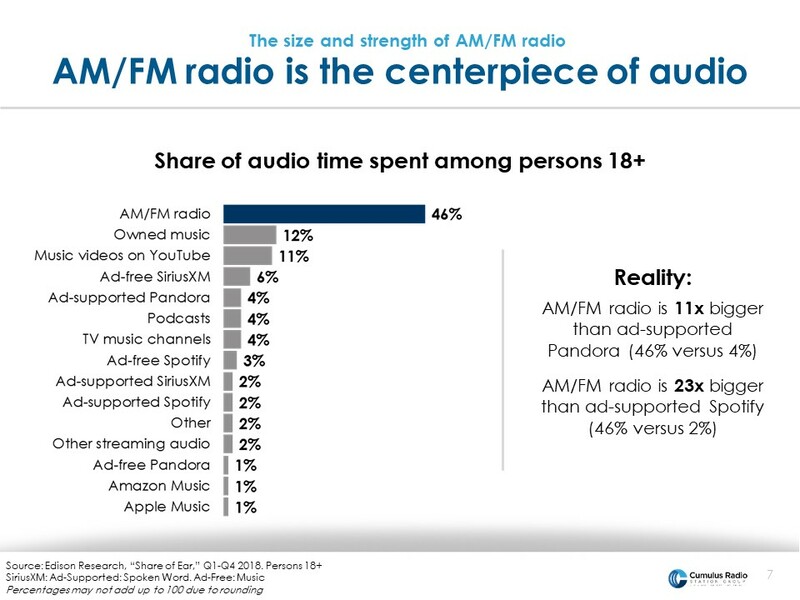 Most of the Pandora, Spotify, and SiriusXM audiences also listen to AM/FM radio. 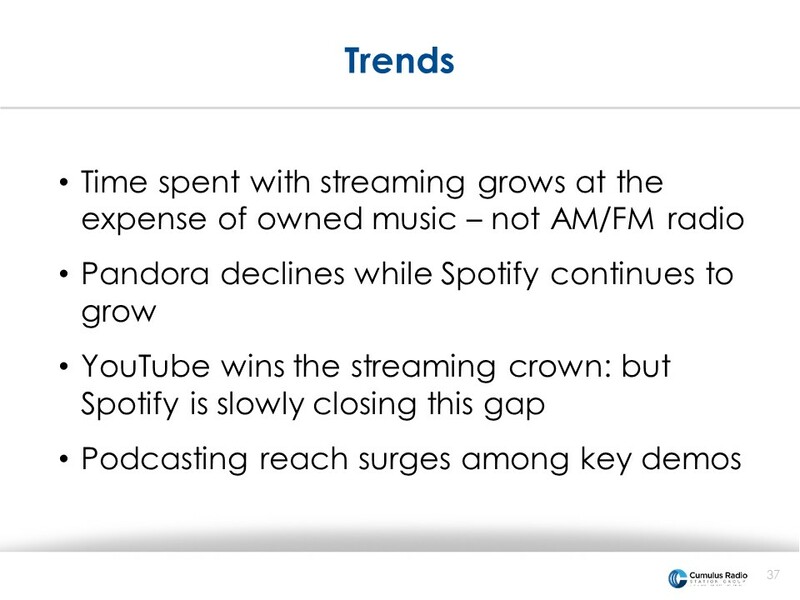 Let’s focus on tracking change over time with streaming and AM/FM radio. We’ll also explore the growing phenomenon of podcasting. As we’ll see in the trending data, Pandora has seen nearly two years of erosion while Spotify’s on-demand offering has seen growth. Despite the shifts AM/FM radio’s Share of Ear is steady as a rock. 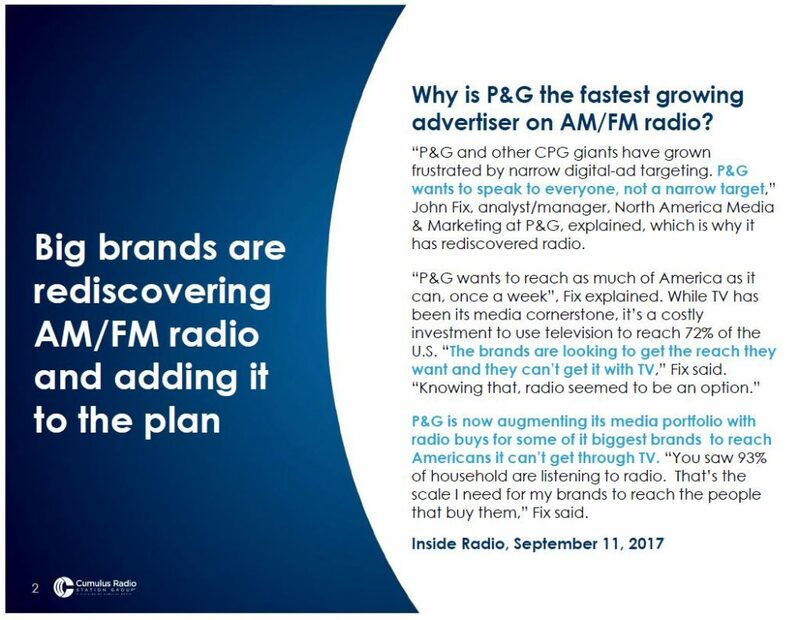 People often assume that the growth of streaming comes at the expense of AM/FM radio. In reality, streaming growth is coming from the time people used to spend with their owned music. Here we’re examining the share of time spent of owned music versus streaming. 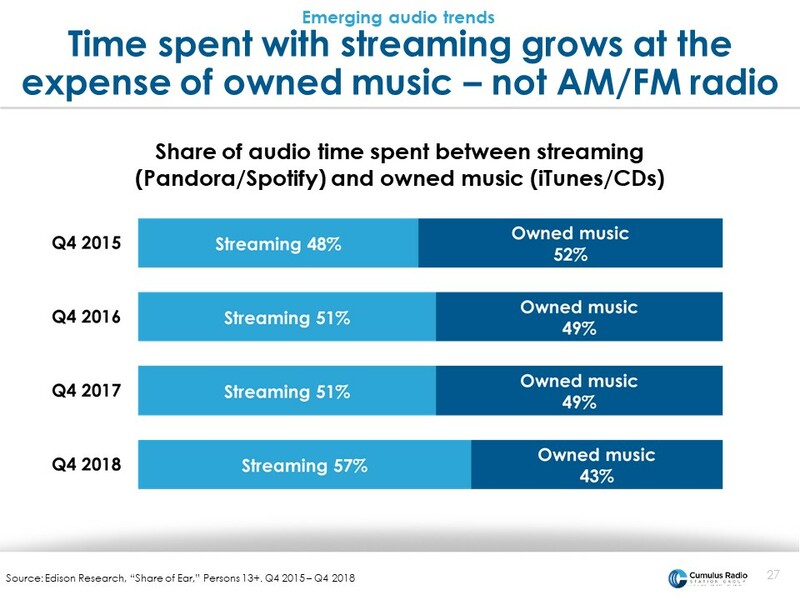 Over the last four years, people are spending less time listening to purchased music and more time with streaming. Overall, Americans are shifting their entertainment habits from owning content to renting it. We used to buy DVDs. Now we can rent video content with Netflix. We used to buy iTunes downloads and CDs. Now we rent our music access with Spotify. While the shift to owned music to rented music has occurred, what’s the trend of Pandora’s and Spotify’s Share of Ear? From two years ago, Pandora experiences a -25% drop in share while Spotify’s has grown +75%. 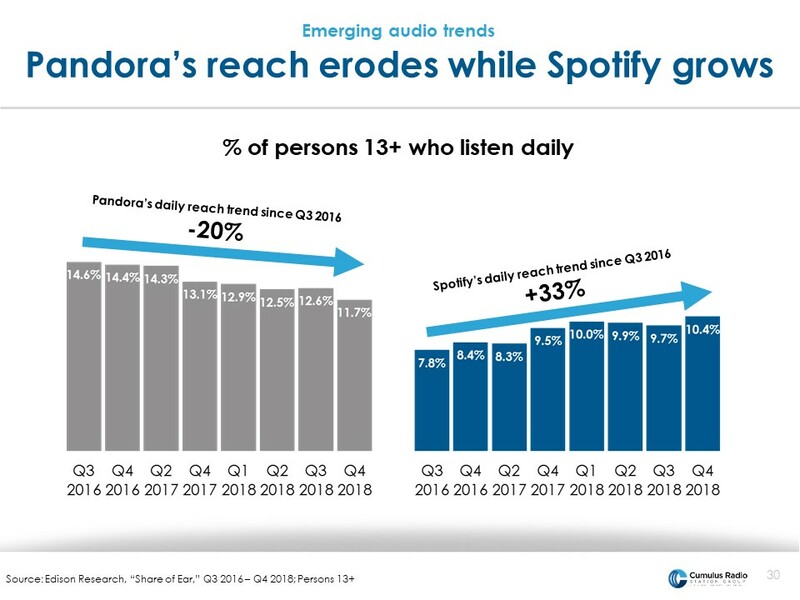 When it comes to total audience reach, Pandora has eroded at the hands of Spotify. From two years ago, Spotify’s ad-free share has continued to rise. 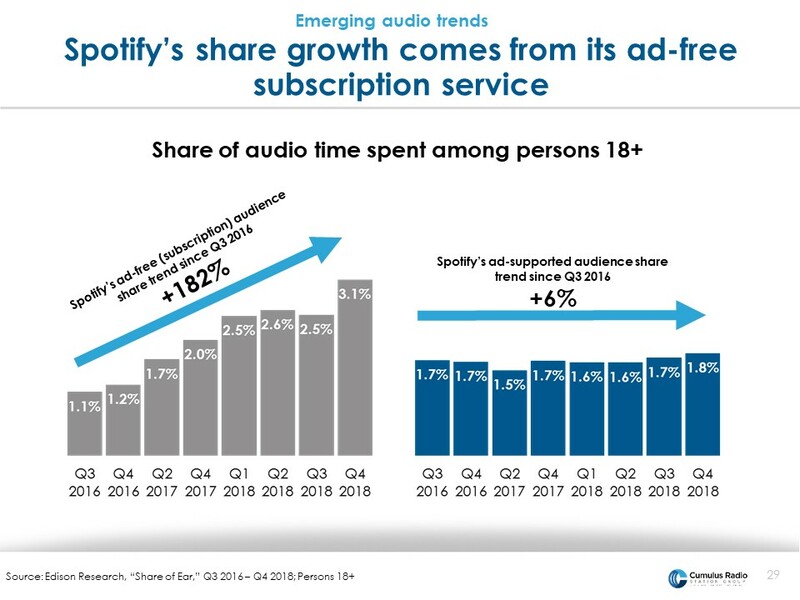 For Spotify this can be a double-edged sword, on one end more consumers are buying their subscription option. On the other, Spotify’s advertisers are reaching less and less listeners, and the ones they do reach are hit continuously with the same ad. From Q3 2016, Pandora’s total audience reach is down -20% while Spotify’s has grown +33%. Let’s take a look at AM/FM radio. 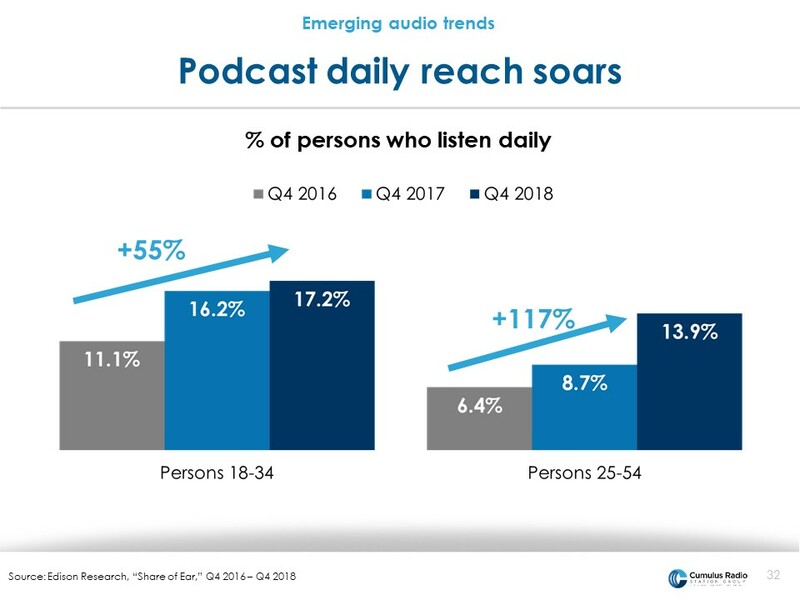 From the Q4 2016 Edison “Share of Ear” study to the Q4 2018 release, daily reach with podcasting is growing among major buying demographics. 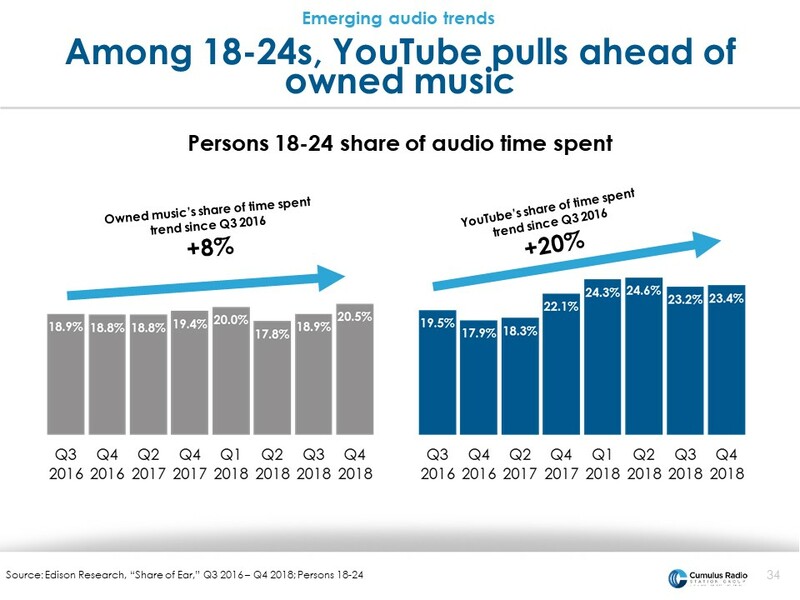 When we look at Millennials, we see some significant share shifts between YouTube, owned music, Pandora, and Spotify. YouTube has pulled away from Owned Music in audience share. 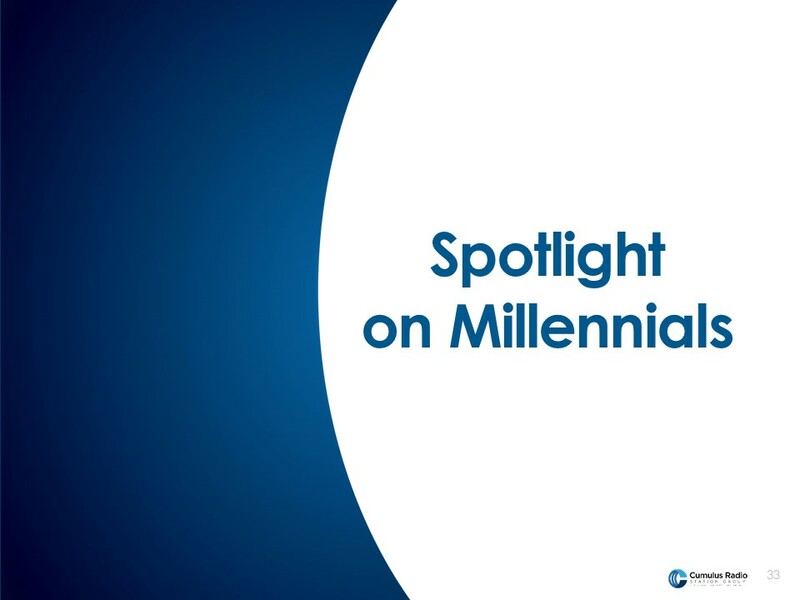 Let’s take a look at the Pandora and Spotify battle among younger 18-24 Millennials. In 2016, Spotify was able to catch up to Pandora. In 2018, Spotify has now surpassed Pandora among 18-24s by a 3 to 1 margin. Daily reach with podcasting is growing among Millennials. 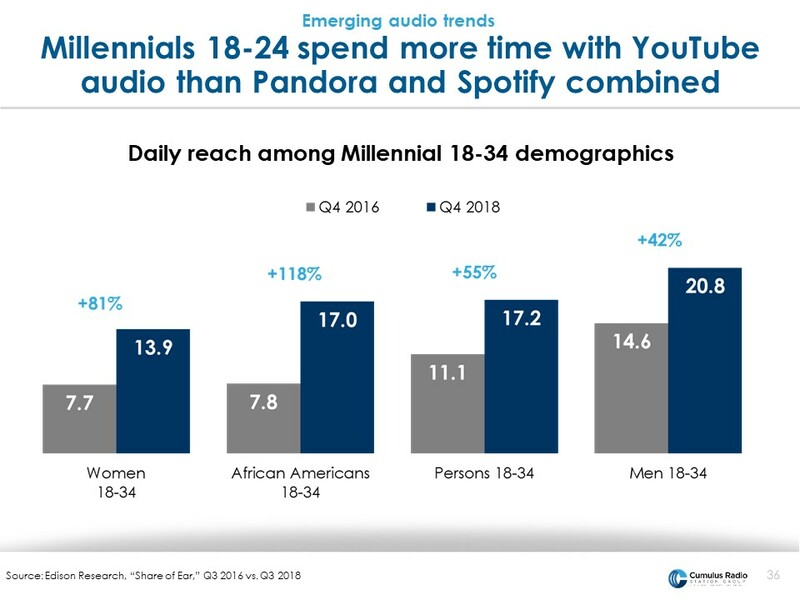 From the Q4 2016 Edison “Share of Ear” study to the Q4 2018 release, Millennial podcasting reach is up double digits. Female Millennial shares are growing faster than men, catching up in reach. In conclusion, time spent with streaming is growing at the expense of owned music. 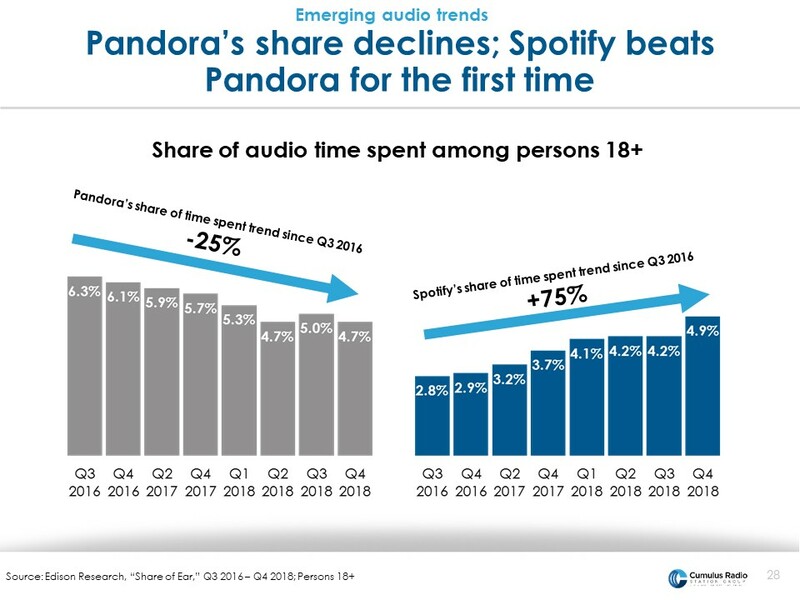 Pandora stalls while Spotify sees growth and YouTube continues to win the streaming crown. Millennials are spending more time with podcasting regardless of gender or ethnicity. 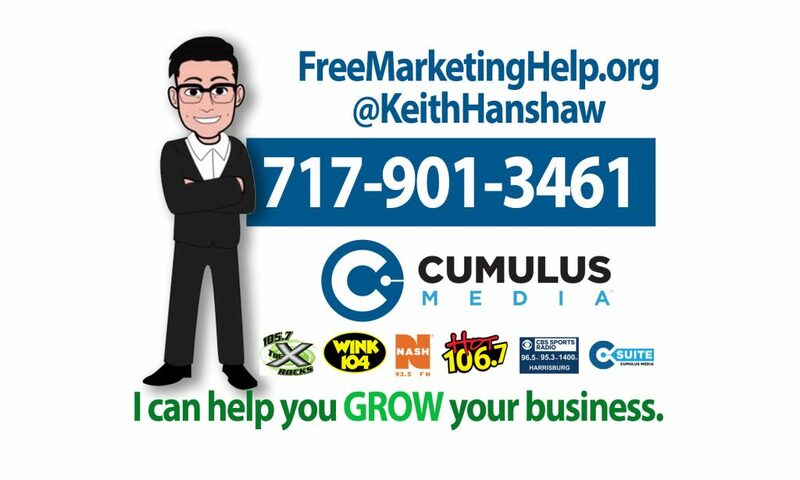 Author khanshawPosted on March 5, 2019 March 5, 2019 Categories Daily Sales TipsTags ad-supported media, advertiser perceptions, am/fm radio, centerpiece of audio, Cumulus Media, cumulus radio station group, daily sales tip, digital audio, edison research, free marketing help, keith hanshaw, listening to audio, pandora, perception, radio, reality, satellite audio, share of ear, spotify, time spent listeningLeave a comment on Share of Ear: Who’s Listening to What? Getting less bang for your TV advertising bucks? 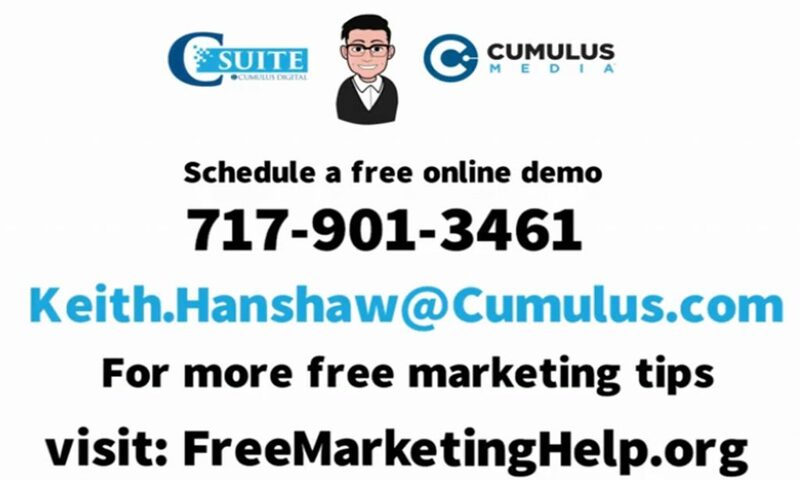 A few years ago, the newspaper industry and yellow pages both went from being a thriving place to market your business and REACH customers to loosing subscribers and customers due to a loss of reach. In advertising, the most important KEY to successful marketing is REACH or the ability to reach customers. 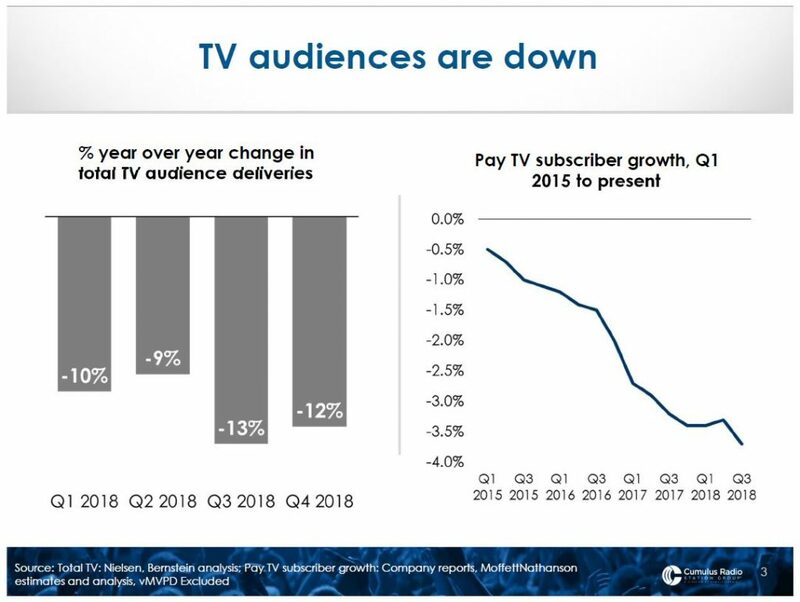 As the internet came around, newspaper subscriptions dropped as their customers were dying and the younger readers weren’t subscribing because they were consuming their news in other ways. The yellow pages used to be the place where EVERYONE looked for a business phone number. Now with smart phones and technology, people simply talk into their phone to retrieve the data requested. 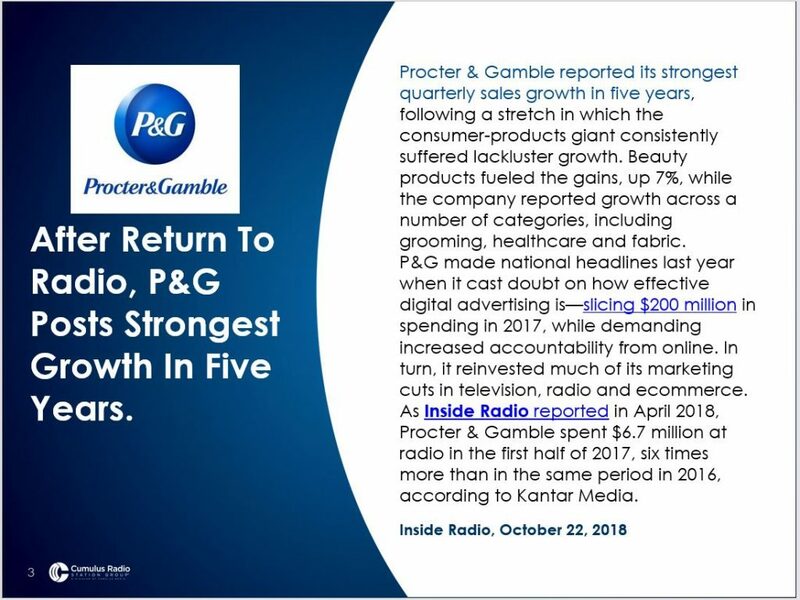 Procter & Gamble, the number one advertiser in the WORLD is moving away from TV and putting more of their ad budget into radio. Why do you think that is? Read on to find out! 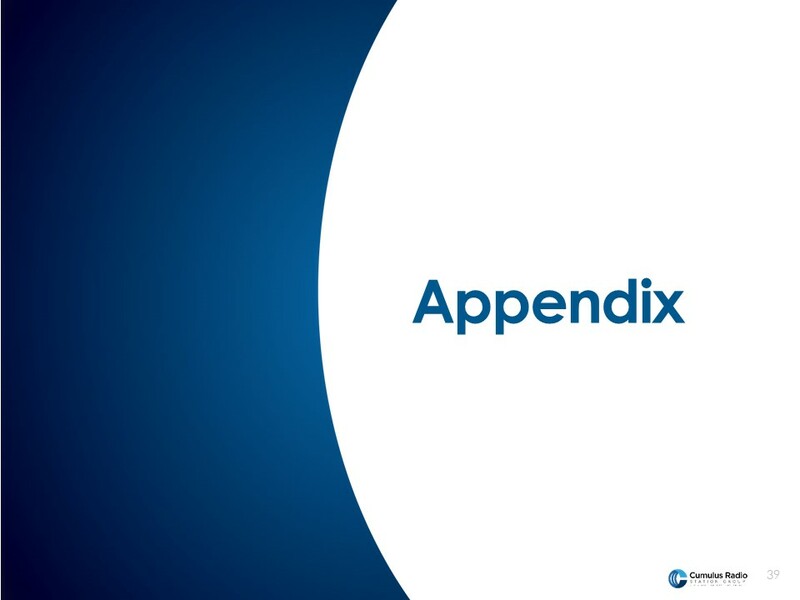 Here is an interesting slide…. 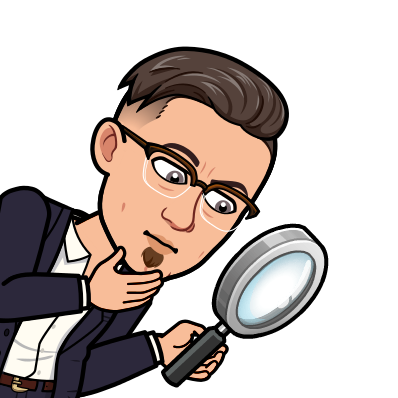 The best lens through which to see your competitors is that of your customers. Regularly asking customers who and what the alternatives to your solutions are may increase selling effectiveness. — What do you offer the customer that no one else offers? (Points of competitive uniqueness.) 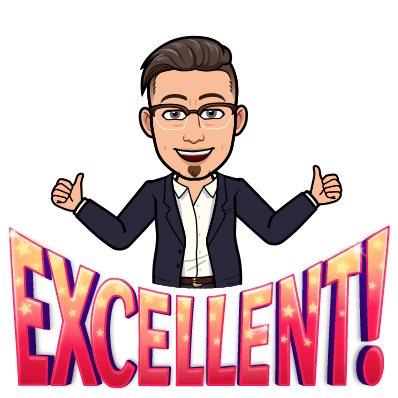 Unique advantages of a product or service are rare. — What do you offer that is demonstratively better than the competition? (Points of competitive advantage.) Advantages are most powerful when you have proof of your advantage’s reality and value. — Where are you equal with your competitors? (Points of equality.) Calling out an equality may help neutralize a competitor who touts it as an advantage. — What are your weaknesses that may hinder your offering to the customer? (Points of competitive weakness.) This weakness can be re-positioned as a chosen weakness that highlights the competitive advantage of your offering. A higher price may mean better quality and service.